Not wanting to pay the full retail price for a Microsoft Xbox 360™ Wireless Gaming Receiver for Windows®, I bought a knock-off from eBay. It turns out that you do get what you pay for – the drivers that came on the 80mm Mini CD were very old and didn’t work with Windows 7. Download and install the latest Xbox 360 Accessories Software (version 1.2 at the time of writing). Plug in the device and open Device Manager (searching in the Start Menu is probably the quickest way to get there). Find your device in the list (it might be listed as an Unknown Device, though mine was labelled correctly), right click it and select ‘Update Driver’. Select ‘Browse my computer for driver software’, then ‘Let me pick from a list of device drivers on my computer’. Pick ‘Microsoft Common Controller for Windows Class’, click ‘Next’, then select ‘Xbox 360 Wireless Receiver for Windows’ and click ‘Next’ again. 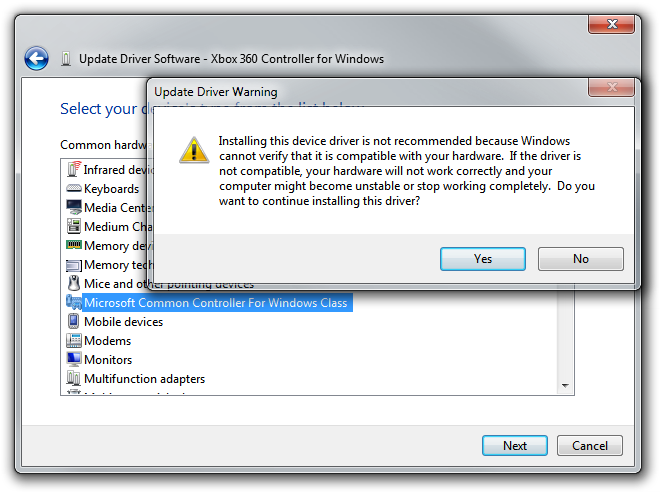 You will be given an ‘Update Driver Warning’ – click ‘Yes’ (and don’t blame me if your computer and/or controller blow up). That’s all. Finally, apparently these drivers are recommended for some applications: XInput Force Feedback Driver (XInput 用フォース フィードバック ドライバ). You should be able to navigate the Japanese on that page – the platforms and languages are spelled out quite clearly. great thing, but the download doesn’t work anymore. Can you send the drivers via eMail? Thanks for spotting that, I’ve updated the XInput Force Feedback Driver link.